Balance bikes are built just like two-wheeled bicycles but don’t have gears or pedals. Unlike tricycles and “big-wheels,” balance bikes encourage toddlers to learn to balance on their own. Fun, and easy to learn, kids quickly adjust to a pedal bicycle after they master gliding and coasting. The best balance bikes have sturdy frames, and adjustable seats and handlebars. Higher-end bikes have hand brakes. Hand-brakes may be too advanced for a toddler, but just right for a preschooler. The Kinderfeets Retro balance bike features a sturdy, lightweight, wooden bamboo frame. This company is proud that their award-winning design is earth-friendly and sustainable. It has a step-through frame with several colorful graphics options. The cushioned seat is adjustable, and the ergonomic design encourages good posture. Airless biodegradable tires are great for toddlers, because they can never go flat. This bike has built-in footrests to help kids transition to pedal bicycles. 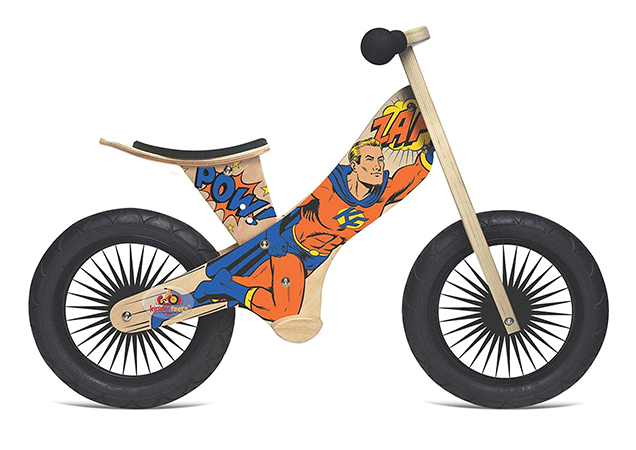 The lightweight, aluminum WOOM bike easy for youngsters to handle. Pneumatic tires absorb bumps and shocks. This is more comfortable and less-tiring for the rider. The steering lock limiter prevents the front wheel from turning too far. This helps kids learn to make small course adjustments. It weighs less than eight pounds, and is easy to lift and carry. It has a hand brake and pneumatic tires. 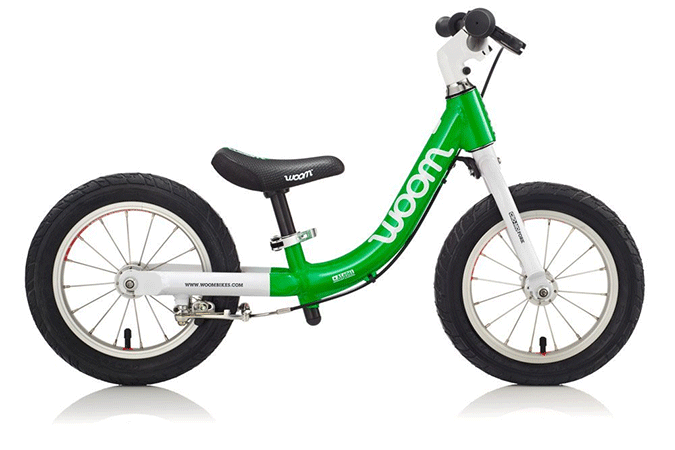 The WOOM bike features durable alloy rims and stainless steel spokes. This balance bike is great for children aged 18 months to 4 years old. The seat height ranges from 10”, for the smallest adventurers, to 14.5” high. 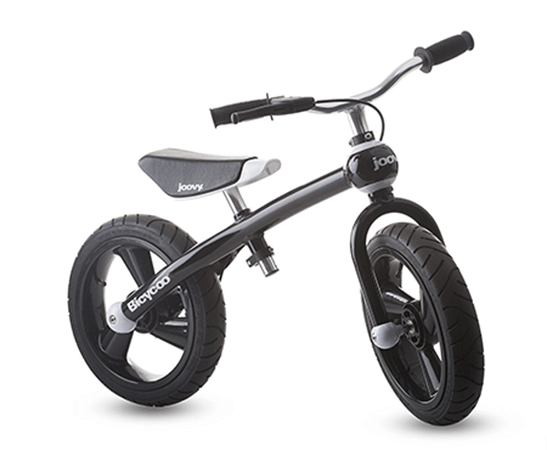 This stylish modern Joovy Bicyoo balance bike features an aluminum frame. This makes it strong, lightweight and weather-resistant. It has 12” pneumatic tires which easily cross small cracks in the pavement. The tires are rubber, not plastic, and are more than 2” wide. This adds stability and durability. The frame design has smooth surfaces and recessed bolts. This keeps little hands and feet safe from pinches and scratches. The contoured, padded seat is adjustable. And the bike weighs only 8.75 pounds, which is manageable for most toddlers. The maximum weight for riders is 55 lbs., and the seat height adjusts from 14”-15.25” as your child grows. 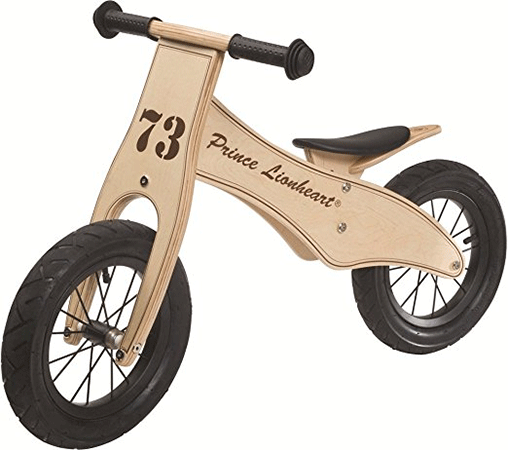 The Prince Lionheart balance bike features classic, unisex styling and a sustainable birch frame. Comfortable, pneumatic, rubber tires keep little ones rolling over bumpy pavement. As the child grows, you can raise the padded seat from 14.8″ to 17″ high. Intended for children from 2-5 years old, this balance bike supports up to 65 lbs. Solid rubber handgrips cushion little hands as they learn to steer. The durable, 100% wood frame reminds children to protect their environment. It also has retro, racing-style graphics on the front and sides. 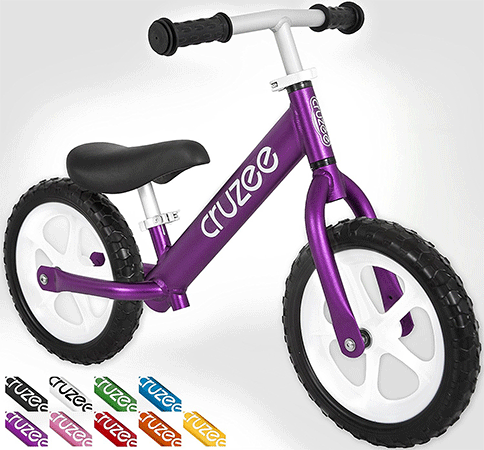 At just 4.4 pounds, the Cruzee may be the lightest balance bike ever made. Its rust-free aluminum frame is strong and lightweight. The wheels have solid spokes and puncture-proof, foam tires. The seat and handlebars are both height-adjustable and have tool-free clamps. This allows parents to make adjustments right away. This bike can handle riders up to 75 lbs. So, as your toddler grows into a preschooler, you can adjust the bike to their size. It’s constructed with low-profile bolts and rounded frame edges to prevent scratches. Plus, it comes in several different metallic colors that kids love. The Critical Cycles Cub combines all the features a parent could ask for. Its smooth steel frame and fork have a step-through design for easy access. Both the seat and handlebars are height-adjustable. The integrated footrests encourage gliding which develops a good sense of balance. Integrated footrests help children learn where to place their feet on pedal bicycles. Solid 12” puncture-proof tires mean parents never need to worry about air pressure. The Cub’s wheels have sturdy solid spokes that won’t bend. This balance bike is suitable for children from 20 months to 5 years old. And it weighs only nine pounds. The seat height adjusts from 12.5” to 17.5,” to accommodate kids until they’re ready for a pedal bike. 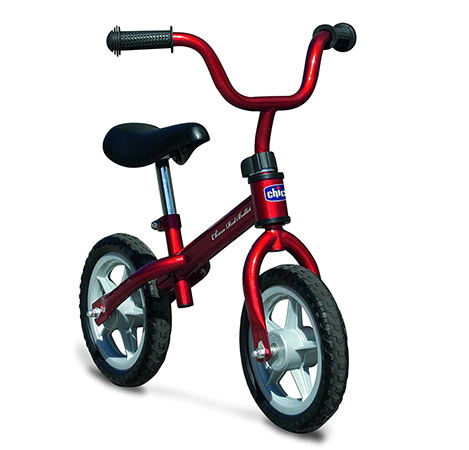 The Chicco Red Bullet Balance Training bike features an attractive red finish and a lightweight frame. The ergonomic design includes a padded seat and rubber handlebar grips, and will adjust to your child’s growth. This bike is ideal for ages three and up. It features an adjustable-height seat and handlebars. The strong metal frame is perfect for riders up to 55 lbs, and the seat adjusts up to 18″ high. Its soft, but puncture-proof, tires are solid, so you’ll never have to inflate them. 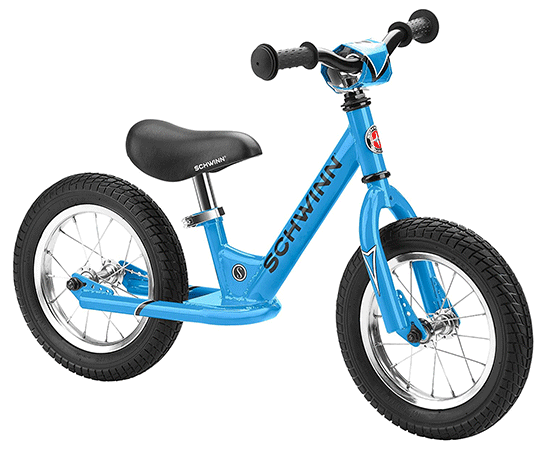 The Schwinn balance bike has a step-through frame design which lets kids get on and off easily. The 12-inch wheels have pneumatic air-filled tires. Both the seat and handlebars adjustable. The seat height ranges from 13.5” to 16.5” high. This bike only weighs about 7 pounds, so it’s easy to handle. It features integrated footrests to help kids learn how to coast. And, it comes in four popular colors, so kids can choose their favorite. 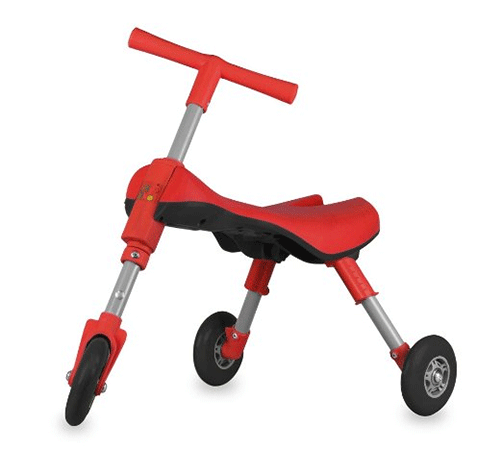 The Strider is suitable for children aged 18 months through 5 years, and up to 60 lbs. It only weighs 6.7 pounds, so it’s easy for kids to handle. The frame is steel and comes in many different colors. This bike has an adjustable padded seat and integrated footrests. The seat and handlebars both feature tool-free clamps, so parents can quickly make adjustments. A seat-post extension is available for taller preschoolers. A padded handlebar with rubber handgrips offers protection from bumps and bruises. The 12″ wheels have solid, puncture-proof, polymer tires for the parents’ peace of mind. 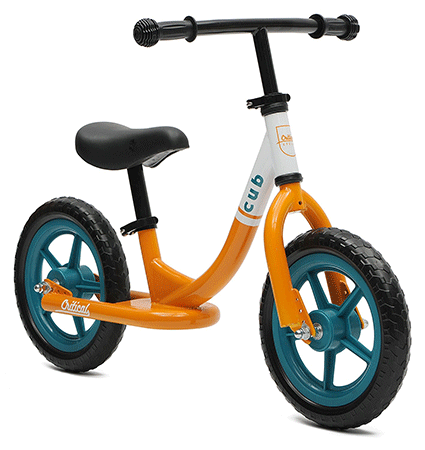 Designed for indoor and outdoor use, the Fly Bike is great fun for toddlers. Small wheels help this tricycle maneuver and glide easily. Foldable, to travel or store under a bed, the three-wheel design is still very stable. Children learn to steer, while high-quality wheels provide a quiet smooth ride. A large, comfortable, built-in seat is a mere 9 inches from ground. This helps build confidence in littles ones with ages from one to about two years old.